Timmy Failure Will Be a HUGE Success! As usual, my friend Beth at Cover to Cover was right on the money with her suggestion of Timmy Failure Mistakes Were Made by Stephen Pastis. I will be purchasing it on my next trip to my favorite bookstore and I know it will not stay on the shelves in our library. Much like Wimpy Kid or Big Nate, Timmy Failure is done in a journal style including drawings and handwritten notes throughout. Timmy is an interesting kid who has the unfortunate last name of Failure. He lives with his mom and starts his own detective agency from his mother's closet. His sidekick and business partner is a polar bear named Total. It is unclear whether Total is real or imaginary, I suppose that will be up to the individual reader to decide. 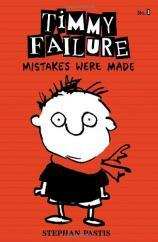 Timmy's detective agency is called Failure, Inc. and the book is the published history of Timmy's life as a detective. He proves to be a little short sighted in his investigations, keeping the reader informed of all of his discoveries with excerpts from his detective notebook. For example when he is asked to investigate a classmate's missing Halloween candy and sees the little brother, Gabe, covered in chocolate with a pile of candy wrappers surrounding him, he writes, "Gabe not tidy." Timmy's adventures continue and his gift for missing the obvious answers to the mysteries he wants to solve provide a lot of reasons for laughing out loud. There is also the other story that sneaks in occasionally. The story of Timmy, the son of a single mom who is having a little difficulty making it. They move out of their house into a one bedroom apartment and Timmy deals with it in various ways including denial, and doing poorly in school. All of it is handled in a way that kids will understand, but not be put off by. Stephen Pastis is the creator of the comic Pearls Before Swine which most elementary students won't be familiar with, but the humor and story telling in Timmy Failure will appeal to elementary readers in grades 2 and up. I think it certainly has a wider age appeal then Wimpy Kid and will be a very popular series. Last Thursday evening, Joyce and I gave up one of our favorite things, NCAA March Madness to host the second Grand Discussion of the year. Since the book Rules by Cynthia Lord was our choice this time, we originally planned to do it before her visit. However, middle school meetings and snow days got in the way and it had to be postponed to after her visit. The turnout was good, 41 folks all together, but the thing that really excited us was the fact that there were more boys than girls, a Grand Discussion first! We have been working to choose books that are appealing to all of our students, trying to get more boys and fathers involved in our little book group and the numbers have grown steadily over the years. It was very satisfying to look out at 13 boys and 7 girls along with their parents for our final discussion of the school year. As usual, the conversation was good and insightful. I am always impressed by what good thinkers our kids are. They surprise their parents many times and we are all reminded that we need to listen to these kids because I promise you, we, the adults, always learn something. Since Cynthia visited us recently the kids really had a new take on her book, they knew things about its creation that their parents didn't. I was very pleased to hear the conversations sprinkled with Cynthia Lord trivia that they learned from her presentations. Just one more testament to the importance of exposing our children to talented authors and giving them an opportunity to hear the inside stories only the author can share. At the conclusion, I realized once again that the Grand Discussion and Newbery Club are two of my favorite things about my job, both are fun interactive times with smart people. to get a new mattress. and new headboard were delivered. will miss me as much as I miss it. Thanks to Ruth and Stacey for hosting us again for the Slice of Life Challenge. 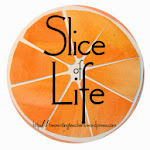 Head on over there to find out what other "slicers" have to say each and every day. I love to travel. Because of that, there is something quite enticing about the pre-planning and organizing of a trip. The planning is a tantalizing taste of wonderful things to come. Tonight, 30 parent-teacher conferences under my belt last night and today, and 14 more to go next week, it was time to savor the small joys of planning a few trips. We leave in a week for Hilton Head, so I began to look for a place to stay along the way since we can't leave until a bit after noon; a perfect distance to get many miles behind us on Friday (but not too many), so that the drive to the island on Saturday will be a breeze. Being the planning geek that I am, I have "google mapped" (do others use this phrase as a verb?) several different possibilities looking for just the right hotel. Bingo! Rock Hill, South Carolina it is! Our daughters are joining us on Tuesday in Hilton Head, and though we will be picking them up at the Savannah airport, our oldest will be driving herself back to Savannah to catch a plane at the end of the trip, so I spent some time looking for best one-day car rental prices for her. This little bit of planning was just what I needed to decompress from the week, and look forward to those wonderful get-aways ahead of us! So I went home last night after dropping Cynthia off at her airport hotel with the intention of posting about the amazing experience the students of Bailey just had. Driving home I was organizing my thoughts and trying to narrow down the many memorable moments from the last two days. When I got home I realized two things, I was tired and didn't have a post in me right then, and, I had forgotten to bring home the right cable to connect the school camera to my home computer. I took it as a sign from the blogger gods that I was supposed to wait until this morning to put my thoughts down. I don't need to say anything about dinner on Monday, Karen nailed it. The only thing that Karen didn't share, was that the flat bread pizza was delicious, and I wasn't willing to share! Over the two days it was obvious that Cynthia Lord loves kids! She is a teacher at heart and can pull a group of 100 or so kids in and hold them there with ease. Even our youngest students, kindergarten and Pre K were mesmerized by her story telling and especially her reading of the Hot Rod Hamster book. Using hand gestures and noises she allowed the kids to choose right along with Hamster as he worked through the books. We were even privy to a preview of the next Hamster book coming out next year, but that's all I'm allowed to say. The Hamster swore me to secrecy! In the Bailey author visit tradition, my fabulous PTO chair person Amy Proctor hosted dinner at her house. I am amazed how easy Amy makes this look when I know she has been working hard to provide a warm and inviting atmosphere for the 15 or so guests. Amy had a wonderful assistant, Christine Sinfield, who will step in as the chair next year. The second day was another busy day, 3 sessions with the students of Bailey and a pizza lunch with our Newbery Club. Once again, these kids did not disappoint with their insightful comments about which books they had read and loved as part of the Newbery experience. We were all intrigued by the behind the scenes info Cynthia was able to share about how the winner is picked, and even some details she heard from the year Rules won an honor. After that she signed wall in THE PIT, inspired by her friend Kirby Larson to use the letter C in welcome. I hope I don't have keep looking for authors whose name begin with the leftover letters, that could get tough! As the day wound down, we had one more special moment, and for me it was perhaps the most meaningful. One of our Newbery kids, Ashley, is an amazing writer and wondered if Cynthia would be willing to look at something she had written. Being the teacher that she is, and being the gracious person that she is, Cynthia was thrilled. So as I went about my end of the day tasks, she sat with Ashley for 15 or 20 minutes and talked, author to author. In the end she left Ashley looking a bit star struck with these words, " I want you to keep working on this. Go home and tell your parents that a Newbery award author said you are a writer, keep at it!" WOW! I get a little water in my eyes today as I write this thinking of the impact Cynthia Lord had on not just Ashley, but all of the kids at Bailey. Thank you Cynthia! My friend Maria wrote about more of the nitty gritty teacher stuff here. Since I confessed yesterday to being a list maker in crunch times, I thought a list for this post just seemed appropriate. 1) Skype with Kate Messner. Frantically try to remember my Skype name so we could connect. Be proud of how articulate students were when she asked them for questions. Gasp in awe as she shared her view, and showed us where Vermont was across the lake. Giggle when kids asked how she came up with the name for Senator Snickerbottom. Groan when it was time for her to leave; I could listen to her forever. Smile as students asked me what other authors I could arrange to Skype with; they love connecting with authors. 2) Get hair cut and colored. Collapse into chair at the end of the day. Take a catnap as the foils were being put in. Begin to read the latest (and last) Maeve Binchy book while waiting for color to process. Purr like a kitten as my head was massaged during the shampoo. Appreciate the color that comes to light when hair is being blown dry. Leave with a hair style I love, but will never be able to replicate. 3) Receive a text from one of my daughters "just because". Know that we will pick her and her sister up in less than two weeks at Savannah airport and we will have our first family vacation in over six years. Delight in the fact that grown daughters reach out across the miles to say, "Hello, I'm thinking of you." 4) Prepare conference forms for the next two days. Reflect on growth students have made this year. Concentrate on the work we still have left to do. Celebrate their learning. Know that conversations with parents help build that home/school connection. Embrace that collaboration. My dad is an electrical engineer. His entire career was spent working at the Westinghouse Aerospace division in Lima, Ohio. He actually designed the generator for the first Boeing 707. Some people credit the Wright Brothers for flight; I think my dad had a little part in it as well. I can't remember a time when there weren't multiple pads of chart paper lying around our house, ready for a list, an idea that needed to be fleshed out, the plans for our garden (or whatever the home project was at the time), or a diagram of something on which he was designing for work. Thanksgiving is not even immune from the ever-present graph paper. My parents love to host our family for this holiday, and for years, my dad has been charting out what needs to get done the week of Thanksgiving, two days before Thanksgiving, a day before Thanksgiving, and the actual holiday -- those lists and charts guarantee that dinner will turn out just the way he wants. Well, it turns out the apple doesn't fall too far from the tree. No, you can't credit me with flight, but when it comes time to plan what needs to get done before an upcoming event, well I'm entirely in my element. Recently, I realized I had multiple fun events and work requirements that were all dovetailing within a few weeks of each other. It was time to do some planning -- plot out when my deadlines were, and then backtrack whatever process I would be using to meet those deadlines. On the fun side, I had a girls' weekend starting March 8, and then we were leaving for spring break around noon on March 22. My work commitments involved preparing for two sessions where I co-presented at the Dublin Literacy Conference, grading piles of writing from my students, inputting grades, writing comments on 52 progress reports by March 11, and getting notes prepared for 42 parent-teacher conferences by March 14. I was a woman who needed a plan, and my dad had shown me the way over the last 50-something years. I chuckled when I looked at how many planning calendars and lists have cluttered my table and counter lately. I had a calendar with all the dates on them, and I had daily to-do lists. None of my work was done neatly on graph paper, but all my papers served their purpose and helped me keep my eye on the ball of what needed to be done. Yes, it's true... I had dinner with a rock star tonight. My kind blog partner, Bill, is hosting the incredibly talented Cynthia Lord at his school for the next two days. He was taking her to dinner and invited me to join them. Truthfully, I had something else planned tonight, but I changed those plans. Because tonight I had an opportunity to break bread (or in our case, flatbread) with a rock star. And what makes her a rock star? Sure, we all know she writes amazing books like the Newbery Award winner Rules and Touch Blue. But better than that, I now know she was a teacher before she was a writer and she has an eye and ear for what will work for specific age groups. I love that. We actually shared several funny teacher stories between the five of us at the dinner table. I conversed over dinner with a rock star. Cynthia Lord is a kind and quietly humorous person who enjoys a good story. We chatted a bit about how excited she was when she first won the Schneider Award for Rules the year it was eligible, and then got the next call from the Newbery committee. How many people get to tell that story? I am so fortunate to have met Cynthia tonight (Bill you have my undying gratitude!). I wish her the very best during her next two days at Bailey Elementary, and I'll leave all the wonderful details about her interactions with the students for Bill. I can't wait to hear all about it because, if I haven't mentioned it already, Cynthia Lord is a rock star!!! Where I stayed this weekend, there was a large sign on one of the walls that said, "I'm on Lake Time." And from the minute I walked through the door of the house, that's exactly the time to which I adjusted. Clocks did not dictate the way we led our lives during this girls' weekend. When we woke up in the morning, that was time to read our books, drink coffee, and take in the views. When we were hungry, that was meal time. When the sun was shining so gorgeously, that was walking along the beach time to explore and look for sea glass. When it started to cloud up, that was starting Downton Abbey marathon time. An arbitrary time between our lunch dining and our dinner dining meant it was cocktails/appetizers time. When we got tired, that was bed time. And every minute of the day was conversation time and friend time. I'm realistic enough to know that every day can't be like that. But this weekend made me realize I need to slow down to stop and smell those proverbial roses when I have the opportunity. I spend far too much time letting carefully delineated "to do" lists dictate my life. My goal is to learn to ignore those lists when I can and enjoy the life that is right there in front of me. The day began bright and early when I woke up and found out I had this lovely lake-view home entirely to myself. I planted myself on the coach that has a 270 degree view of Lake Erie, and watched the sunrise while watching bluejays fly from bush to bush, and the Erie waves stay frozen in time and space. As the sun continued to rise, I opened one of the books I had brought to read and nestled in to enjoy the story until my housemates woke up. Once my friends awoke, the entire day lay ahead of us with no plans except to relax and enjoy. As I mentioned yesterday, food has not been a problem for us - except maybe that between the group of us, there are too many foods from which to choose. After an exceptional breakfast, we headed out to walk along the beach - crazy, right?!! Here in Huron, Ohio, where the high maybe reached 40 degrees later in the afternoon, we went out searching for sea glass to add to the collection already here in the house. With the sun shining on our backs, and digging sticks in our hands, we sifted through the sand to find the perfect pieces of sea glass for over an hour. How good is life that my most pressing issue was trying to decide whether to go further down the beach or head back to the house? After lunch (yes, we ate more food), we nestled in for a Downton Abbey marathon. Three of us had never seen any of the episodes, and now we are totally hooked!! What a great way to spend an afternoon while looking out at the lake. Now, we have taken a break for showers, and are beginning cocktail hour with appetizers to boot. And a few more Downton Abbey episodes thrown in as icing on the cake. After school today, I rushed home to pack the car, pick up one of my friends, and hit the road. We were headed for a girls' weekend to meet other friends at a house that sits right on Lake Erie. Woohoo!! I chuckled to myself as I packed the car for this short amount of time and looked at how many bags full of groceries and beverages I was putting in the car. I laughed even more when my friend started loading her groceries and beverages. We could seriously eat and drink our way through just our supplies in a week... maybe. Then when we got to the house and saw the counters and refrigerator overflowing with yet more food, we realized how excited we all had been for this trip. We were settling in to relax, reconnect, and hopefully rejuvenate (and enjoy some amazing food and drink along the way). I'll be posting more about this trip over the weekend. Girlfriends are so important to us as women and I'm glad we carved out this time for each other. Today was quite an easy day for me to find my OLW, "joy". I was so excited once the call came at 5:00 AM, that I went ahead and got out of bed; I just didn't want to lose one precious moment of this gift. If you've been following my posts, you know that February was a difficult month in our house. Today was the very first opportunity I had to unwind from all of that. At 5:00 AM, I padded downstairs in my pajamas, slippers, and robe, and nestled into the couch to catch up on both slice posts and blog posts from some incredibly thoughtful people. For an hour or more, I read from my very overloaded Google Reader, left comments, and felt joy at being able to connect with my personal learning communities. After I had breakfast, I sat down at the kitchen table to do progress report comments. I see 52 students each day, so I had 52 comments to make about their growth in language arts. When it's quiet in the house and I'm using my brain at the beginning of the day without interruption, it is amazing how quickly those comments got completed. I was officially done just a few minutes before 11 AM. The rest of the day was a package to unwrap in whatever way I wanted. So I did something crazy - I booked a pedicure. Our neighborhood streets were beginning to melt and my husband assured me the main thoroughfares were wide open. So I went to the salon and I loved every minute of the soaking, the salt-glo massage, the exfoliation, the lotion massage, and the painting of the toes. I'm sure people thought I was strange walking around in my flip-flops but I didn't care one iota. The whole event was spontaneous and made me happy. I finished a children's book (Hold Fast by Blue Balliett) and began a thriller by Tami Hoag, Down the Darkest Road. Nothing deep, just fun escapism. More joy. Followers of Literate Lives know that one of the reasons Karen and I started this blog was our fascination with Newbery Award winners. We shared the goal of reading the winners and honors every year and that brought us to where we are today, reviewing good books for kids. One of my all time favorite Newbery books is Hattie Big Sky, a 2007 honor book. Never mind Newbery, it's one of my all time favorite books...PERIOD! It is the only book we've ever done twice for Grand Discussion and I still get it into the hands of my better readers as often as possible. Two years ago, Kirby Larson visited Bailey and revealed to our Newbery Club that she was working on a sequel to Hattie. This was after much questioning from our group about what happened to Hattie next? As with most books they read the kids wanted more to the story, they needed closure. We have been eagerly waiting to find out what happens next for Hattie, and after finishing Hattie Ever After, I can honestly say, she done real good! In Hattie Ever After, Hattie travels to San Francisco with dreams of becoming a newspaper reporter. She hooks up with a traveling Vaudeville show and arrives in San Francisco chasing not only her dream, but trying to solve some of the mystery behind Uncle Chester. Kirby Larson is a master of research and accuracy. Her description of San Francisco in the 1920s and Hattie's small town reaction to the city are wonderful and draw the reader into Hattie's next adventure. As Hattie pursues her dream she is pulled into a mystery surrounding Uncle Chester and some shady dealings that he may or may not have been involved with. New characters help Hattie's investigation and career advancement, and of course Charlie is back and the on and off romance continues. The book is a little more romantic than the first, but true to Hattie's character, she doesn't give up her goals and aspirations. I really liked Hattie Ever After, it's always fun to see what happens next for a favorite character. I'm thinking the kids that read the first Hattie are going to approve of what Kirby Larson has done with this special character. I'm pretty sure they will be satisfied with the ending and able to let her rest. I have a million things to do in the next three weeks before our spring break. I have 52 progress reports to do, three sets of parent-teacher conferences, several professional development opportunities, and those are just my work commitments! But I apparently am never too busy to start planning what I will be reading during spring break. I have purchased some books from our local independent bookstore, I have pressed the Amazon Prime button several times for 2 day delivery, I have perused our local public library, and I have begun the process of stockpiling my Kindle library. How exciting to know that three books I have been dying to read were delivered to me today -- two on my front doorstep and one on my Kindle. I can't wait to dive into Requiem, The Runaway King, and The Center of Everything (March 5 was certainly a banner day in the world of children's book publishing)!!! I am also very excited to read the books for both of my book clubs -- one group is reading Joy for Beginners, and the other group will be reading The Persian Pickle Club. Both appear to have wonderful characters that I can savor and get to know while lazing around at the beach. This spring break, our girls will be joining us for the last 3 1/2 days, so I have thought about what to put on the Kindle that we will all enjoy since we share an account. Luckily, all four of us love to read. In fact, my husband becomes a voracious reader of fiction when we are on vacation. I love to see him unwind just a little bit more from his everyday stress with each book he completes. I have downloaded the last two Baldacci books just for him (well for me too, but I read them over the holiday break). My OLW for this year was "JOY". Inspired by our friend, Ruth, I wanted to look for the joy in as many moments as I could. But I have to tell you, parts of the month of February made that very difficult to do. My father-in-law was rushed to the emergency room on Jan. 31, and by the next day, Feb. 1, things had progressed to a place where he left the hospital, and moved to an end-of-life facility (very hospice-like). He was there for six days before dying. His funeral was Feb. 11, two days shy of the anniversary of his wife's death eight years ago on Feb. 13. Dad's suffering wasn't prolonged. That is always reason for gratitude. The end-of-life facility, Kobacker House, was a true gift to us as a family. From the nurses who took such good care of him, to the doctors who made sure he was never in discomfort, to the aides who bathed and talked to Dad, to the custodial staff who cleaned his room, to the chaplain who would listen to my husband tell numerous stories about his dad and growing up, to the social worker who smoothed the way for us financially -- we will never be able to tell them all how very much we appreciated their kindness. We are blessed to have so many caring relatives, friends, and coworkers who were willing to make a 6 hour round-trip just to let us know they cared and to pay their final respects to Dad. We are so grateful to have you all in our lives. Our family and friends that actually live in Youngstown; you stood by our side during a very difficult time. My brother for being a hero - one of the girls had left something at the hotel she wanted to place in the casket before it was closed forever. He thought nothing of heeding my frantic request to drive 20 minutes back to the hotel to retrieve this very precious item minutes before the prayer ceremony at the funeral home. My college roommate for being there throughout this entire ordeal - what would I do without her?!! She was my go-to person for over a week during the time Dad was at Kobacker House - she brought us food to eat during our time there up until the day of the funeral, where her presence and hugs meant the world. She and her husband dropped everything to be there for us. She still continues to check in regularly. I do feel both joy and gratitude that she is my friend. My husband wrote the most beautiful eulogy for his dad - I cry every time I read it. He couldn't stand up and deliver it, but he made multiple copies of this tribute to his dad. What a gift of words he gave to his dad and to us as he celebrated his life. All the cards of caring and sympathy that people sent. I will never underestimate the importance of this small gesture. We were very appreciative for each of those cards. And there is joy knowing how peacefully Dad left this world and went to the next. I know he and Mom T are together now, and that brings me peace. So, no, joy isn't a word that comes to mind. And the healing is still a work in process. But, my heart is full of gratitude right now. each and everyone of your students. then compare those to where they began. as we begin a new week. A first year teacher I have the pleasure of working with, was chatting with me this week in the hall. She had just gotten back from a skiing trip to Utah with her family last weekend and I was inquiring about her trip. It sounded incredible. One thing led to another, and our conversation shifted to how I lived in Utah for a year and a half back in the 80's (long before this darling teacher was even a gleam in her parents' eyes!). She was curious to know how I got to Utah, and if I had lived there, why would I ever come back to Ohio??!!! Last year, during the SOLC, I told the story of moving out west as a 22 year old; first to Jackson, Wyoming and then a little further south to Salt Lake City, Utah. But this new colleague only knows me as an experienced teacher, and she was surprised at what I shared. As time got away from us, she questioned me further about some details. And at the end, she very gratefully thanked me for sharing this particular story with her. I didn't question her further about what she was thanking me for, but it did make me stop and wonder. I do get her surprise about my life "before" what it is today. After all, I have two daughters very close to her age, who still are surprised at my unconventional move out west -- I didn't have a place to live, didn't have a job, didn't know anyone, didn't have a place to live, and really couldn't ski very well at all. Who does that?!! Thanks to Ruth and Stacey for hosting us again for the Slice of Life Challenge. Head on over there to find out what other "slicers" have to say each and every day. I love hearing the behind scenes thinking and stories from so very many of you. "Mom, will you please stay in the waiting room? Promise you won't go?" "Mom, will you make me scrambled eggs and a milkshake with fresh strawberries when we get home?" "Mom, can you bring me the bag of frozen corn to put on my cheek?" "Mom, I'm hungry again. Could I have another milkshake?" "Mom, please come upstairs!! I feel like I'm going to be sick. I feel so nauseous." "Mom, please don't go. I still don't feel well." "Mom, is it time for one of my pain medicines or my antibiotics?" "Mom, what about pieroghis for dinner? They're pretty soft." "Mom, will you watch a movie with me?" When both of our daughters lived at home, and requests such as the above seemed to be frequent, there were times I felt annoyed, and tried to instill more independence in both of them. But my youngest was home yesterday for her spring break, and unlike some of her friends who were headed to warmer climates, she came home to have gum surgery. I spent the entire day with her yesterday, just being a mom -- taking her to the procedure and making sure she was cared for all day. And after having both girls gone from our home, I realized how much I loved being a mom and taking care of my babies. "Thanks for taking care of me, Mom." Thanks to Ruth and Stacey for hosting us again for the Slice of Life Challenge. Head on over there to find out what other "slicers" have to say each and every day. I love hearing the behind scenes thinking and stories from so very many of you. I look forward to being part of the community again this March. My goal is to write and post every day, but in the spirit of being kind to oneself, I'm also giving myself permission to post at least 5 days a week, depending on what is happening in my life. Happy slicing to all! !